You may wish to save this photo-map to a folder to save re-downloading. Each type of object located has been assigned a coloured symbol (see the Legend at the bottom of the map). Each type of symbol is given a number & these numbers are assigned more or less in the order in which I located the the objects. If the objects were geographically close together they have the same number and are designated A,B,C etc. for clarity. These same numbers are used to identify photographs of the objects in the corresponding photo pages. 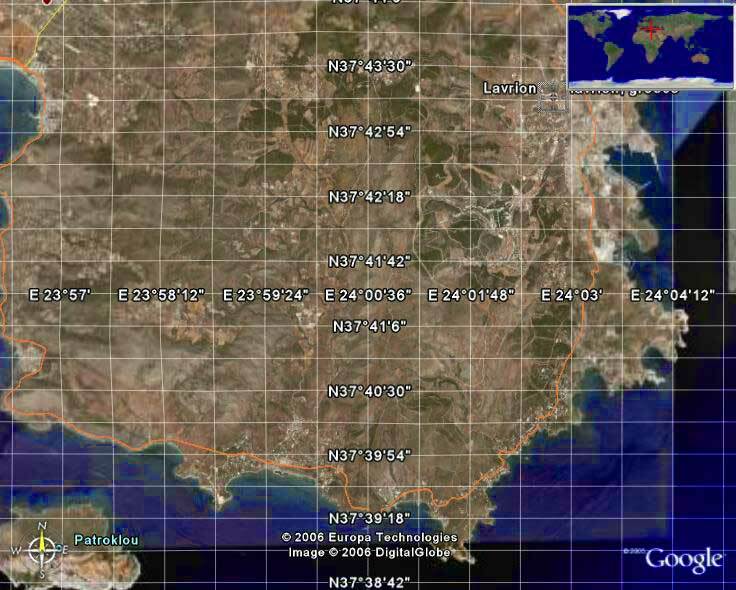 See below the old aerial photograph for the latest Google Earth satellite photograph of the entire Lavriotiki area. starting at Legrena and terminating at Aghios Konstadinos.